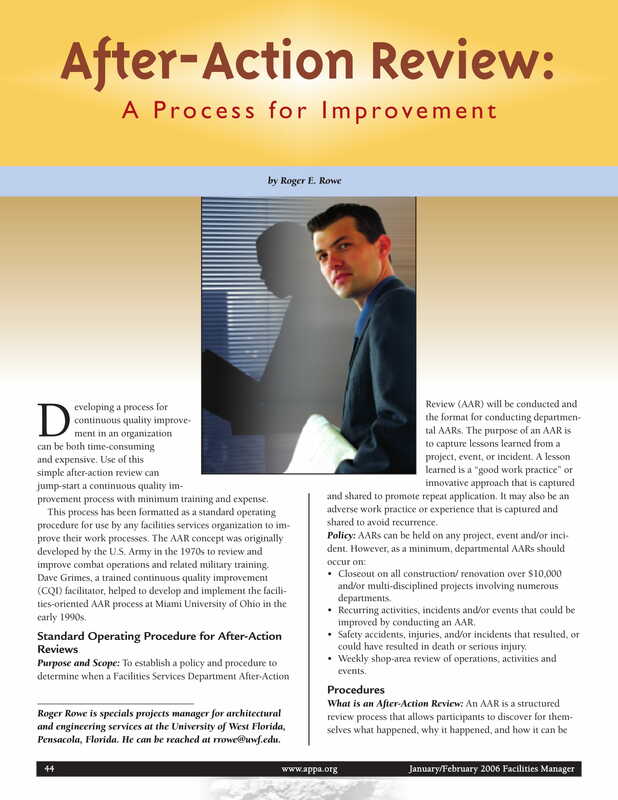 An after action report is a document that is used for the assessment of project results. However, the usage of this tool is not limited to the specified matter as this can also be incorporated in the evaluation processes for programs, events, business efforts, and other activities where reporting and evaluation of results are necessary, recommended, or required. You may also see report writing examples. Hence, the completion of a project or any other undertaking signifies the start of the after action report’s usage. 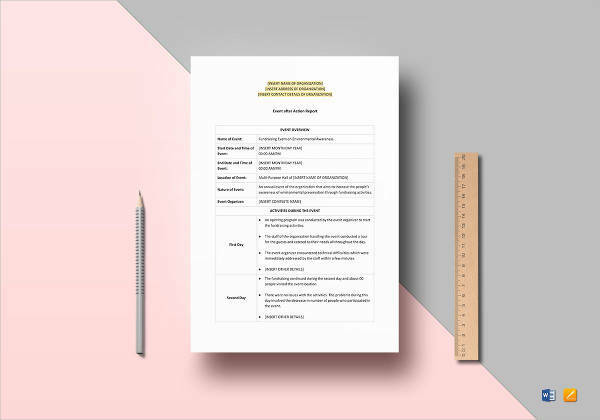 Just like a school action plan, you have to make sure that your after action report is direct to the point, specific, and formatted properly. 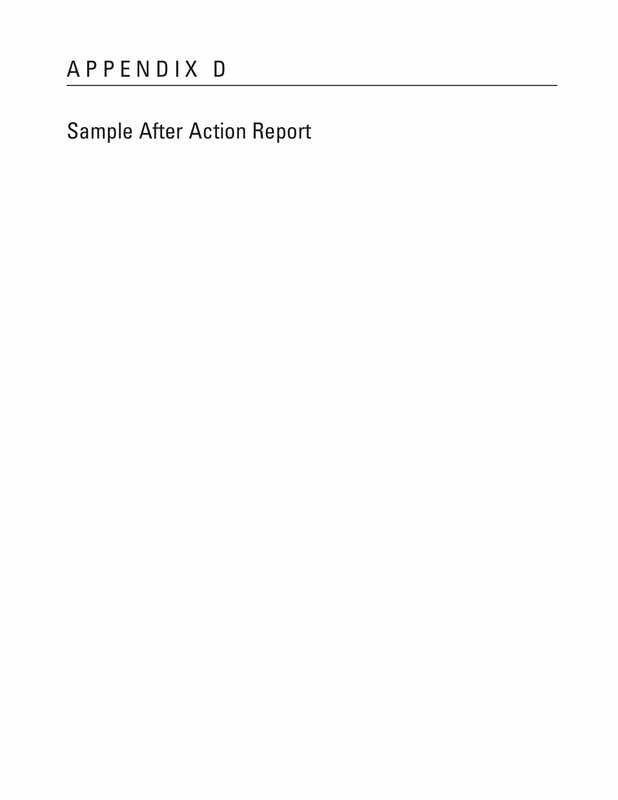 We have listed a variety of after action report examples that you can download and use as references. 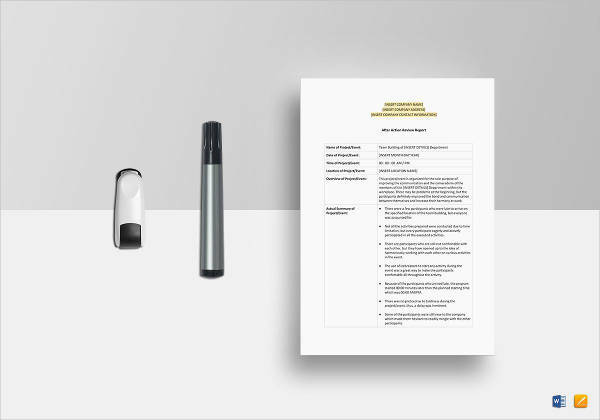 Browse through the selection of examples that we have curated in this post so you can identify the particular document that is similar with the specific after action report that you need to develop. You may also like investigation report samples and examples. Emergency action plans, corrective action plans, after action plans, and any other kinds of business action plans used by businesses and organizations must adhere to particular quality standards to ensure the effectiveness and efficiency of their usage. With this, involved entities must always follow guidelines, protocols, and regulations that will help them develop and use the document accordingly. 1. 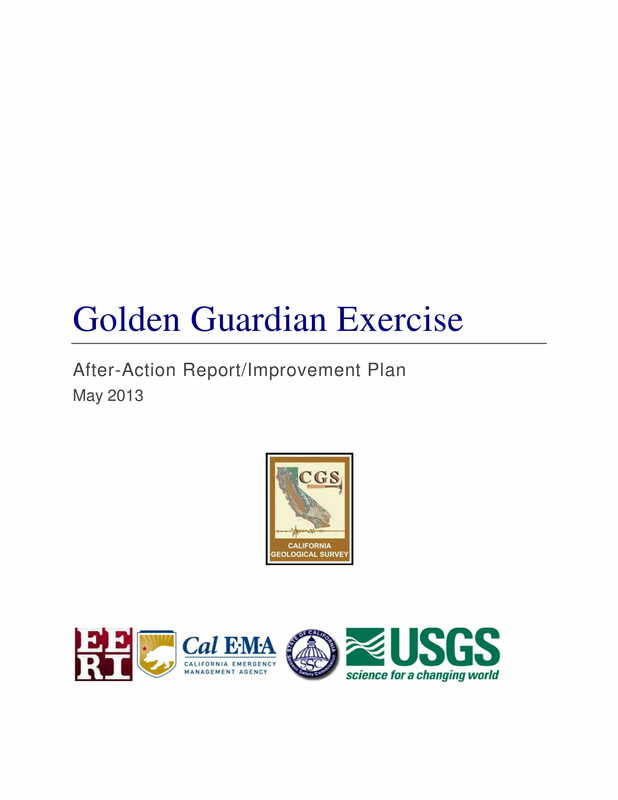 Do not rely just on the existing after action report examples alone. 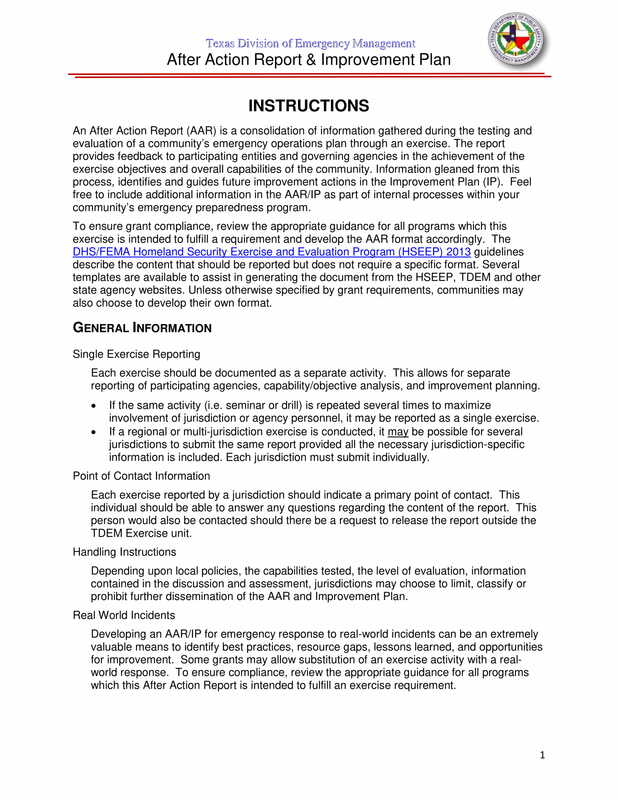 There are a lot of references that you can use when making your own after action report. It is essential for you to always be aware that there are different kinds of after action reports and that you should always stick with the nature or core of your activities or project so you can ensure that the document that you will develop is aligned and relevant with the functions that you would like it to serve. 2. Base the discussion within your after action report on your needs as well as the requirements of all the other stakeholders of the project. After action reports can sometimes be very brief and short but there are also instances where it can be lengthy. This actually depends on the scope of the project, the range of work processes that are needed to be done, and the time frame that the project team follows when executing their responsibilities and obligations. You may also see project report examples. 3. Ensure that the content of your after action report is based on updated, realistic, measurable, and credible information. It is essential for you to work with raw details that are based on the actual project results. You have to be observant and thorough when doing this material as it will be used as a reference for new undertakings that you will be involved with soon. You may also like status report examples. Developing an after action report should be a collaborative effort that comprises of all the team members responsible for the actual implementation of a project. As we have mentioned in the discussion above, you can create an after action report once a project has already been completed or finalized. You may also see research report examples. In this manner, you can ensure that your observations are based on the actual output that is essential to be assessed for any particular purpose that you may have. 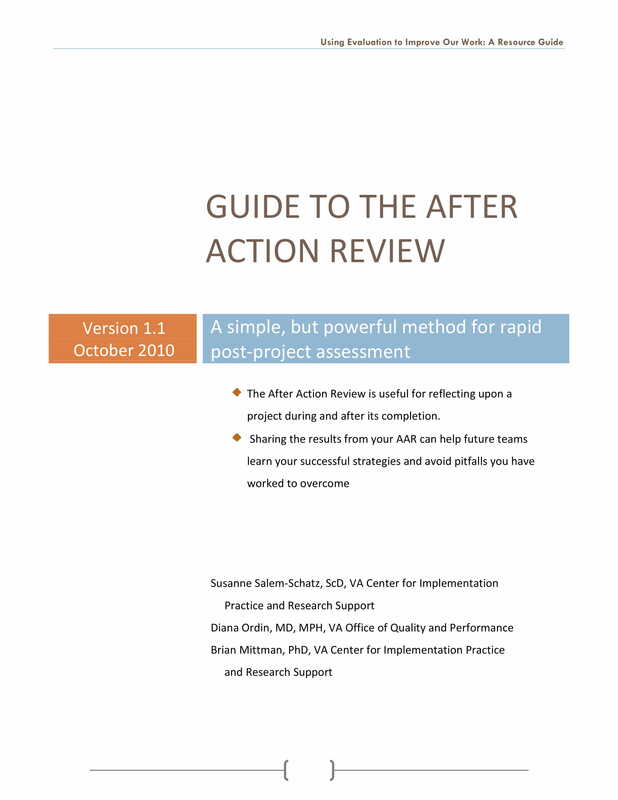 When creating an after action report, the entire team should ask themselves with necessary and relevant questions that can reflect their assessment and insights about the project’s outcome. 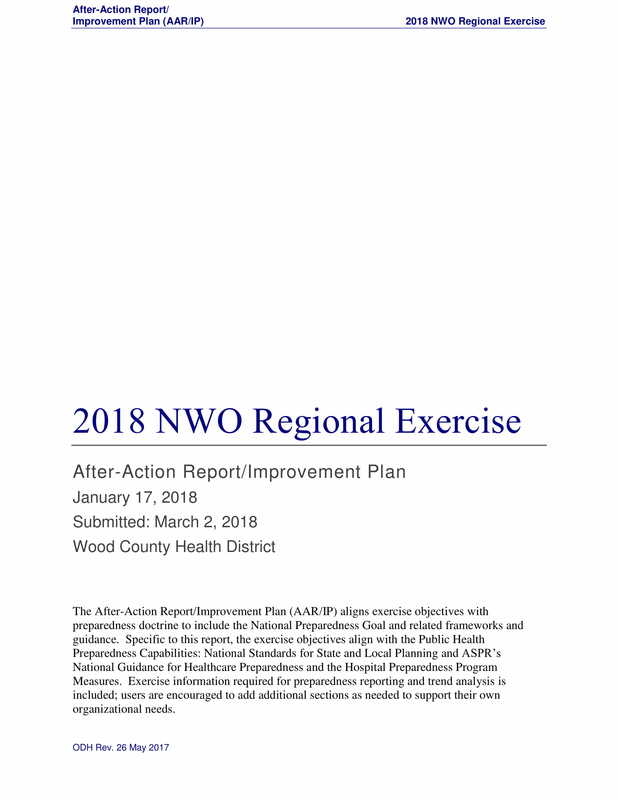 Some of the inquiries and points of concern that the team should ponder on and that can also serve as the guidelines in the development of an after action report are listed below. You may also like English report writing examples. 1. Go back to the objective and goals of the project. It is important for the team to start with the output that project is expected to achieve. With this, they can compare the similarities and the gaps between the supposed project output and the project result that the team came up with. The core of the project is important to be addressed so that proper metrics for evaluation can be incorporated in the processes of project assessment. 2. Present all the aspects of the project plans that actually worked. It will be great for your project team if you can come up with the listing of your strengths so you can capitalize on them accordingly. Moreover, this will help you identify your work processes that is actually beneficial in getting the results that are expected from different stakeholders of the project that you are working with. 3. Aside from the aspects of the project plans that worked, list down those that did not as well. Just like when creating a remedial action plan, you should develop an after action report that is based on the overall facts of the undertaking. Knowing what went wrong can give you an idea of the lapses that negated your vision and objectives. 4. Make sure that there is a clear and specific presentation and representation of what the project actually achieved. Do not cover any faults and mistakes. More so, it is suggested for you to come up with a list of the objectives that you have achieved and the goals that you were able to materialize. It will be very helpful during your assessment if you can have the knowledge about the level of standards that you have met when developing the project and finalizing the output that you are currently evaluating. You may also check out consulting report examples. 5. Reflect on the project’s value. With this, you can easily point out the areas that still needs improvement. Even if there are times where you cannot change the output that you have already came up with, this will help you to address these issues on your future projects. Hence, wrongdoings and defective actions can be terminated when executing your work actions for your upcoming transactions. You might be interested in academic report examples. 6. Again, look into the expected output and the actual output of the project. List down the reasons or the specifications on why there are relative differences between the two. You must be able to present the gap between the project’s vision and the project output that you have at hand. In this manner, you can ensure that there is clarity when it comes to the identification of the factors and elements that affected your work processes and the results of the project. You may also see marketing report examples. 7. For future considerations, think of the things and activities relevant to the project that you would have changed if you are given the chance to do so. With this, you can have an idea of the resources that you were not able to fully maximize or the work functions that could’ve been better if only you focused on its executions more. Lessons learned are actually gains for your project team, so do not forget to include these details in the after action plan. Report writing examples for students and professionals are great references whenever there is a need to develop a document that presents information about a particular undertaking. If you do not have any idea on how to create a particular report, like an after action report, having references at hand can help you a lot. Listed below are some of the useful tips that you can refer to if you want to start making an after action report. 1. Focus on the key points that should be discussed in an after action report which includes the goals of the project, the evaluation of the things that happened during the project, the items that went well within the project development, and the items that can still be improved should the project team be given the chance to alter any of the project output areas. You may also see quality report examples. 2. Do not veer away from the facts and figures that you need to consider. Honesty of the project team can actually reflect their credibility and trustworthiness. 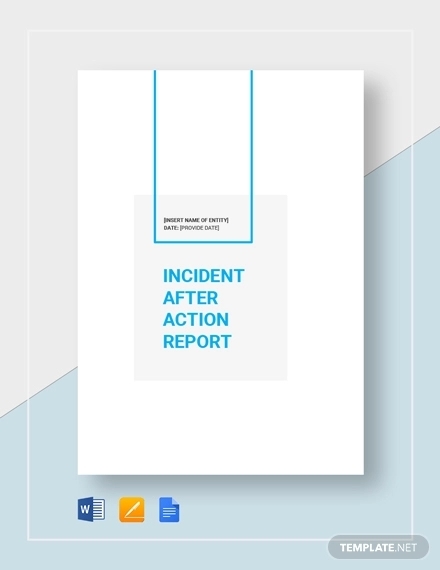 Aside from the team, there may be other entities who can have access with the after action report, which is why it is important for particular descriptions to be as real as possible so that the team will not ruin their image due to falsification of the document’s content. 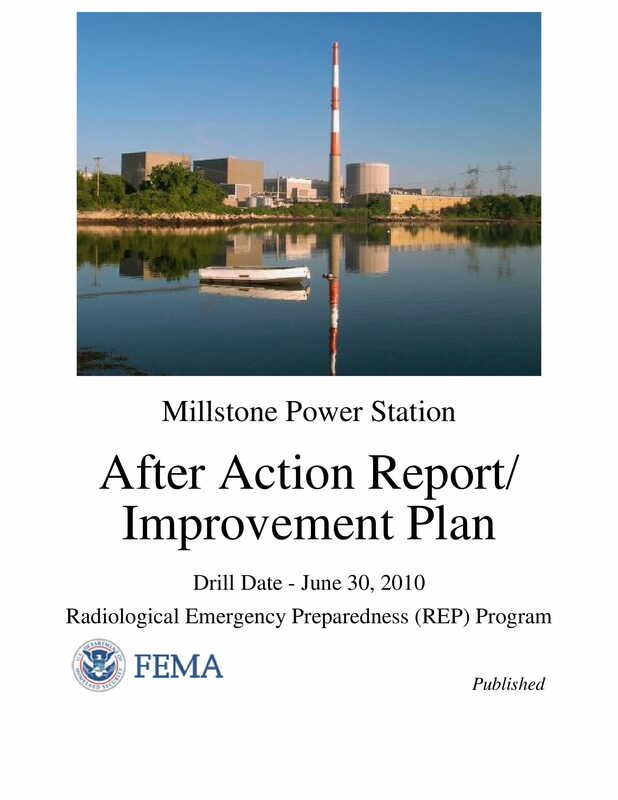 You may also like examples of short report. 3. Remember that an after action report should not serve as a blaming session, as it is not one. The reason or the purpose on why there is a need for this document to be developed is for the continuous growth and development of the project team. Hence, this document should not cause any outrage as the content of the after action report is just based on facts and the assessment of actual project outputs. You may also check out technical report examples. 4. It is important for the person who will be tasked to put together the content of the after action review that the entire team is in full general agreement with the discussion. If there are things that are still unclear or has not been discussed thoroughly, another meeting should be made or follow-ups for evidences and proofs must be established. In this matter, a well-formulated and credible after action report can be established. 5. 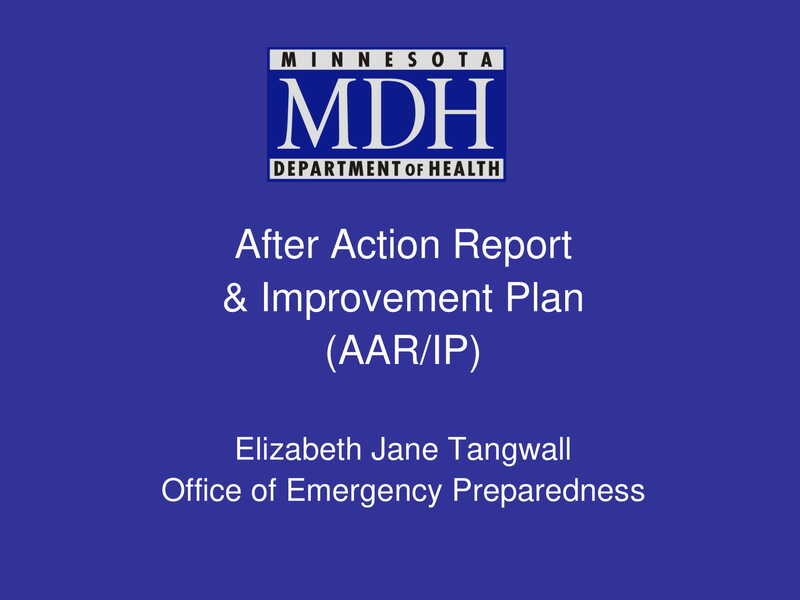 The development of the after action report must be on the nearest date possible after the project’s completion. This is to ensure that the results of the project are still fresh in the mind of the members of the team. This will help all entities involved to get over with the things that went wrong and those that actually what are expected from the very beginning. You might be interested in management report examples. 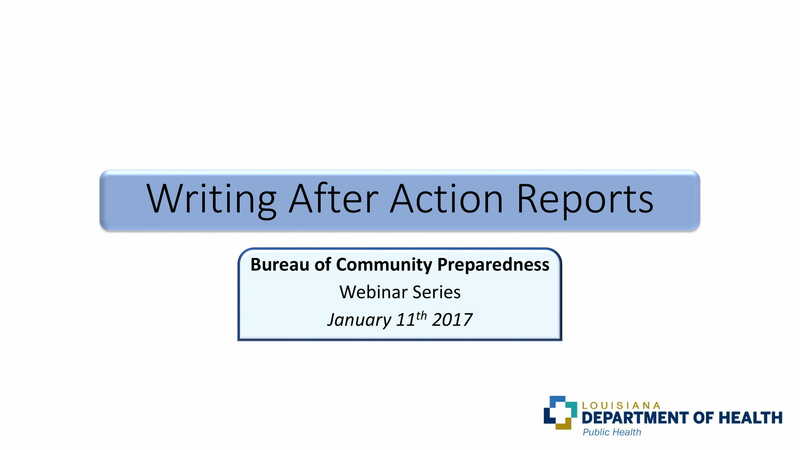 Ready to Develop a Comprehensive and Detailed After Action Report? 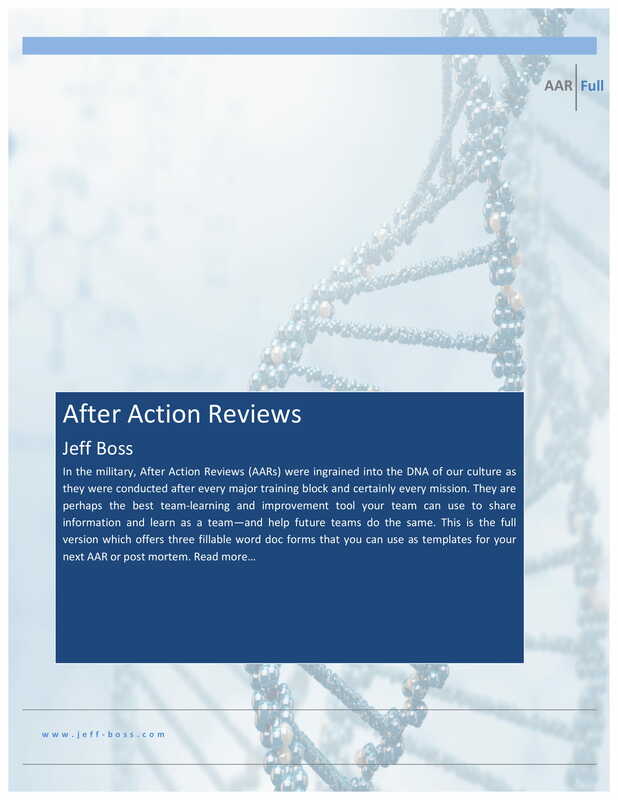 Are you still having second thoughts on whether to make an after action report or not? If you have not decided about this, keep in mind that the purpose of using an after action report is to present the objective evaluation of the project. Hence, it is essential for you to include only the necessary and real information that can showcase the quality of the output that you came up with. You may also see formal report examples. There is no need to hide weaknesses, gray areas, and failed tasks as these can only help you to record your mistakes and shortcomings so that you can also come up with a list of improvements if you will be immersed with the same kind of project in the future. Think of it as a win-win situation even if unexpected things have occurred. You may also like sample activity reports. 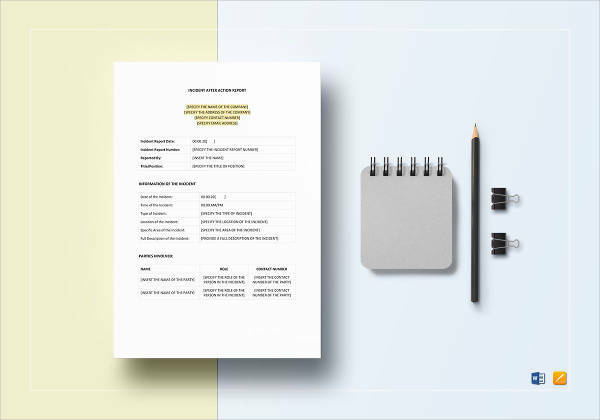 Once you are already prepared to draft your own after action report, we recommend you to look into downloadable examples, printable report writing formats, templates, and other kinds of references. The processes and activities that worked and those that did not can be listed and recorded accordingly if you are well-guided with the development or creation of the document that you need to create. 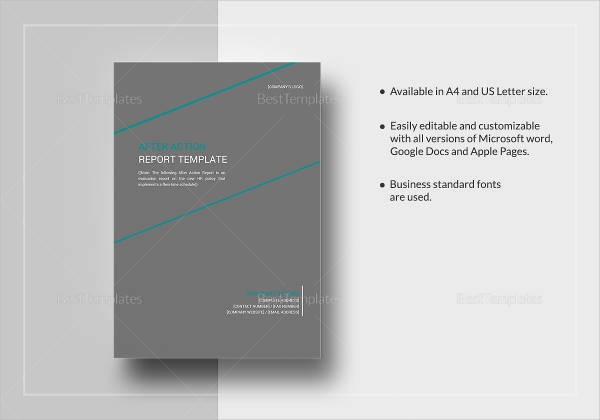 We already provided you with relevant discussions and highly usable examples that can make it easier for you to come up with an after action report. Make one now for the benefit of your team and for the betterment of your future project undertakings. You may also check out free report examples.